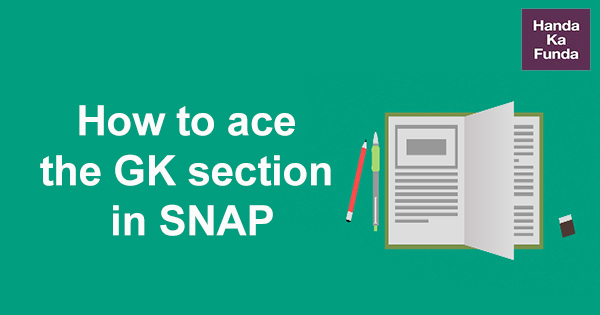 Home » Blog » How to ace the General Knowledge section in SNAP test? SNAP GK consists of 30 marks with 25 marks (20 normal and 5 special questions) each and there is 0.25 marks penalty for wrong answers. The type of General Knowledge asked in SNAP does not require the student to spend too much time on any question. Most questions are on popular topics which have dominated the news in the last months. The current affairs in the section usually cover topics from the field of Technology, Sports, Politics, International affairs, Indian and World Economy and Businesses and Awards and Prizes. It cannot be emphasised enough how important newspapers are. SNAP has a higher weightage for current news versus static news and often picks up relevant topics. One should not see a newspaper’s role as being limited to information. They not only help keep one abreast of the news and know how to solve the GK section, but also provide the needed perspective on topics which can come in use in interviews and especially group discussions. Our toppers Vipul and Nikita personally referred to Indian Express for the unbiased viewpoints and Times of India for the availability. For a course like an MBA in Business Analytics which needs at least two years of work experience, the expectations from candidates to be better read might be higher. For the same, having a good perspective on the economic state of the country is important which newspapers like Mint and Economic Times can provide. Ideally a candidate should spend an hour a day for three months going through the various sources to become adept at SNAP GK. They should start with the resources available with them, newspapers and then move to websites and mobile resources. “Everyday when I woke up I would read Economic Times. Having done my CFA, I was able to absorb business news better and in fact this regular reading has helped me get my CFA Level I certification. I also maintained a notebook with the different sections in GK which I filled every day for close to twenty minutes, this helped me get all the current affairs in place through the months leading to SNAP. Preparing for my CFA also helped me understand business news better and therefore I had to only spend 45 minutes to 30 minutes reading the newspaper. Aspirants should also consider having a diary, notebook, file etc. where they keep a note of important events which have dominated the news. The expectation from applicants of SNAP is that they are well aware of current happenings. Overall, GK is something that needs continuous investment. It cannot be done overnight and needs continuous reading, which is why most aspirants do not focus on this. This is where reading this becomes a competitive advantage. This article was contributed by Aditya Kovvali- 99.6 in SNAP. SNAP GK – How to prepare for General Knowledge Section in One Week?